PSI has moved to our new 10,000 sqft office space on 11200 Waples Mill Road in Fairfax, VA, maintaining a close proximity to many of our valued clients. This new space symbolizes the potential for growth and opportunity as we part ways with Legato Road. While it is difficult to say goodbye to this building, after calling Legato Road home for years, this new space offers a plethora of opportunity with the same great team. It’s not about where you are at but who you are with, right? 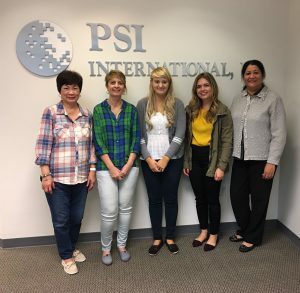 Regardless of moving offices, this team is what distinguishes PSI from other local businesses. Our office does not define us, but we are defined by how we work together and what we accomplish together. This new office provides us with the opportunity to create new memories together and accomplish more than we could imagine. Moving offices initially seems like a daunting task, but it is also an opportunity for progressive and positive change. A new office is like a blank canvas that the PSI team paint together to convey our mission and goals. With this exciting change, and as long as we continue to work together and strive for the best, the new office will symbolize our efforts as a team and the potential opportunities that come with teamwork.